The 979-page plan from Rep. Dave Camp would mark the most significant changes to the U.S. tax system since 1986. (Bloomberg) — The top Republican tax-writer in Congress proposed restructuring the U.S. tax code to eliminate dozens of breaks to pay for reductions in the corporate and individual rates. 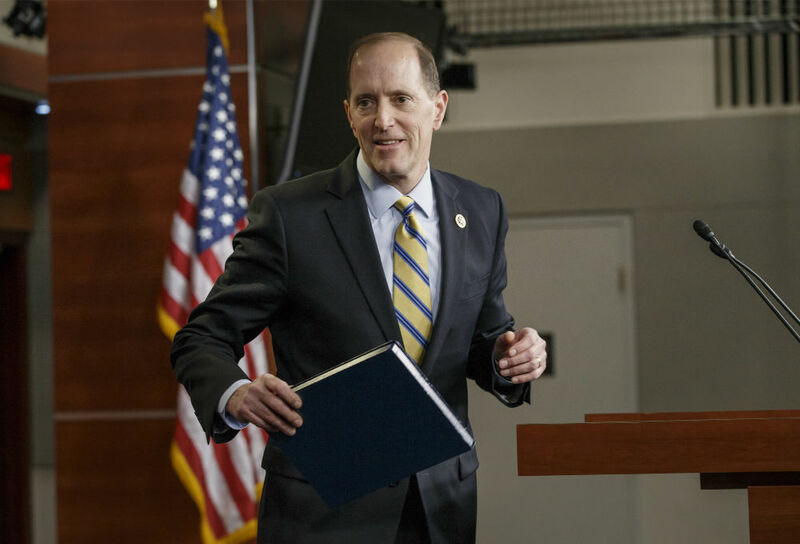 The 979-page plan from Representative Dave Camp would mark the most significant changes to the U.S. tax system since 1986, affecting every part of the economy and reflecting politically unpopular tradeoffs that sparked immediate complaints from business groups. Though it’s unlikely to become law this year, Camp’s plan is a blueprint that lawmakers may use in the future and its ideas and details will shape U.S. tax policy going forward. The proposal includes new limits on breaks for health insurance, retirement savings, mortgage interest and private equity managers’ carried interest. The plan would repeal breaks for student loan interest, moving expenses, accelerated depreciation, and state and local taxes. Corporations would have a top rate of 25 percent, down from 35 percent. Individuals would have a top rate of 25 percent on their taxable income, down from 39.6 percent. The actual marginal rate for top earners would be higher. They would be subject to a 10 percent surtax on a broader base that includes municipal bond interest and employer-provided health insurance. That would apply to married couples earning about $450,000 in 2013 or individuals making $400,000. Top earners also would lose certain benefits, such as the 10 percent bracket, as their income goes up. The proposal would yield “a simpler, fairer tax code that leads to a stronger economy,” said Camp, a Michigan Republican and chairman of the House Ways and Means Committee. Camp’s goal is to reshuffle the tax burden while generating the same amount of revenue for the government — and doing so without reducing the burden for top earners. Republican leaders are staying mum on the details and Democrats say the plan should increase revenue for the government. “We have an obligation to debate the big issues of the day,” Camp told reporters in unveiling the plan. White House spokesman Josh Earnest praised Camp for proposing to reduce tax breaks that “the president has long advocated” curbing. Senator Charles Schumer of New York, a senior Democrat on the Finance Committee, called Camp’s plan “dead on arrival” because it would eliminate the state and local tax deduction, which is important to residents of high-tax states such as New York and California. In releasing the plan today in Washington, Camp provided the most complete picture yet of the tradeoffs required to satisfy the rate-cut objective Republicans have set. He proposed a 3.5 basis-point quarterly tax on assets of the biggest banks and insurers, and limits on the deductibility of entertainment, advertising and research expenses. He proposed repealing the last-in, first-out accounting method using by many oil companies and wholesalers. Some breaks, such as the tax exemption for credit union income, were untouched. U.S. multinational companies would have lighter taxes on their future profits earned outside the country. Under the plan, they would pay a one-time tax on assets they’ve accumulated outside the U.S. under the current system, with the proceeds dedicated to the Highway Trust Fund. In response to concerns from companies including Corning Inc. and 3M Co., Camp created a two-tiered rate structure for the one-time tax. Cash and equivalents would face an 8.75 percent tax; other assets, such as the value of factories, would have a 3.5 percent rate. Industry trade groups reacted swiftly in opposition to many of the specific provisions, arguing that they would be hurt or were singled out. Rob Nichols, president of the Financial Services Forum, said the tax on big-bank assets countered Camp’s stated goals. “A tax that singles out one specific industry is utterly inconsistent with the fundamental goals of tax reform to lower rates, broaden the base, and remove industry-specific treatments,” said Nichols, whose group is composed of chief executive officers of the 18 largest financial institutions. In response to a question about the bank tax, Camp said banks would benefit from the corporate income tax rate cut and that it was necessary to make the plan revenue-neutral. The National Retail Federation, whose members often have high effective tax rates, immediately backed the proposal. John Engler, president of the Business Roundtable, which represents major U.S. company chief executive officers, called the proposal a “significant step forward” though he said more must be done to increase growth and make businesses competitive. For individuals, Camp would increase the standard deduction, repeal the personal exemption and expand the child credit. He would also reduce the size of a mortgage eligible for the mortgage interest deduction to $500,000 from $1 million. Those changes would reduce the percentages who itemize deductions to 5 percent from about 30 percent now. Camp would create a new system for taxing capital gains and dividends — a 40 percent exclusion. When applied to the top 35 percent rate, that would mean a 21 percent basic tax on long- term capital gains and dividends, which would be added to the 3.8 percent investment income tax that Camp would retain. The plan would push people into Roth-style retirement plans that rely on after-tax money instead of tax-deferred accounts. New contributions to standard individual retirement accounts would end. Private equity managers and others who received profits income as carried interest would pay $3.1 billion more over the next decade, with a portion of income that is now considered capital gains becoming ordinary income with higher rates. The plan excludes real estate professionals. That’s a smaller tax increase than what Obama has proposed.